Disappointed to find themselves back at Trillium, the girls of 14U Black arrived at the Bugarski Cup in an expectant, if not mildly vicious mood, bent on gold and redemption. Pool play featured encounters with the colours of autumn in DRVC Orange and Stingers Yellow, who as leaves oft do in that season, fell before the girls of DA Black. The morning match against DRVC commenced in typical fashion, with the seeming need for DA to bust the rust off the hinges before they could swing free. While there was no real adversity faced in the first set, the morning blahs were evident in the 25-13 effort as DRVC’s points came largely from Black errors. The wheels spun more smoothly in the second set as more consistent serving and better coordinated attacks led to a rather efficient 25-6 win. The first set of the second match saw a rather trepidatious group of Markham Stinger girls take the floor against a confident Durham Attack Black. Unnerved by a monstrous blast out of middle and the eight point serving run that began the set, the Stinger girls didn’t seem terribly disappointed to keep the contest brief, offering no opposition in the 25-4 affair. The second set saw a more capable Stinger’s six on the court, but while they could pass up a serve, they too had little luck containing the Black, falling 25-10 and sending our girls off to lunch first in their pool. Quarter-final play found the Black facing the hard working young ladies of 13U club mates, TNT. While they did exhibit some explosive potential, the younger team seemed to struggle, however, with the powerful serves of our 14U girls and could not quite find their feet in the 25-8, 25-10 match. The semi-final game against the Titans Quest seemed initially more challenging as inconsistent serving and attack missteps on the part of DA allowed the Scarborough team to keep the score close in the early going. Yet, in time a good free ball producing serving run, and consistently excellent first passes by the Black, were enough to stymie the Titan’s progress as they collapsed in the 25-13 DA win. Their confidence shaken, the Titans struggled with both delivering and receiving serves in the second set, and with their last shank their ‘quest’ ended 25-12. This win secured a spot in the finals for our girls against a surprising DRVC team. 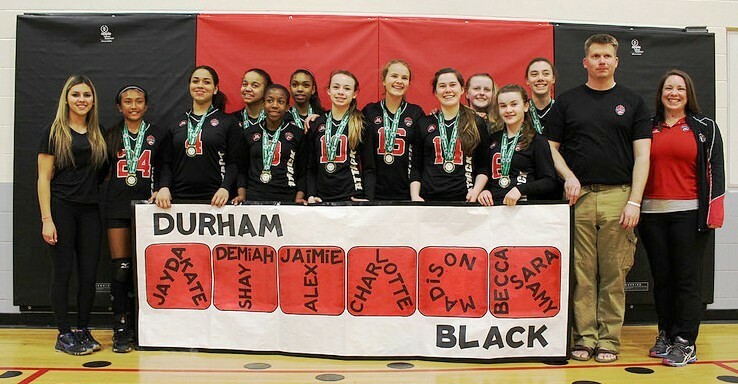 Whatever skill or good fortune led DRVC to the finals seemed to abandon them as they faced the Black for gold. Their points coming almost exclusively from DA errors, the beleaguered Durham girls struggled to complete their passes and seemed to fall apart in the 25-9 first set. While displaying a little more of the talent that fueled their success, DRVC were again overwhelmed in the second set. While they were able to organize attacks off the serve, they were countered at every turn by outstanding DA defence and explosive hitting, leading to a 25-12 win for the Black and giving them their third first place finish of the season. If the girl’s victory at the Bugarski Cup seemed somewhat anticlimactic and their celebration a little muted in comparison to past examples, no player seemed to protest as the gold medals were distributed. They were expected to win and they did, which was as much a competition with themselves as with their opponents, and thus no small feat. The mood was celebratory at the pizza party that followed at the Lohmann residence (We thank them for their generosity) as the team reflected on the season that has passed and looked forward to the challenges that await at the Provincials and Nationals to come. As Shakespeare wrote in The Tempest: “What’s past is prologue.” Their greatest days are before them.